Sweet potatoes are the edible, underground root of the sweet potato vine, with a tan-colored skin and sweet-tasting, bright orange flesh. Baking is a popular method of preparing them. Low in fat, a baked sweet potato is a healthy source of calories and nutrients. One medium-sized, baked sweet potato is approximately 2 inches in diameter and 5 inches long. It weighs 114 grams and provides a total of 103 calories. That same medium baked potato has approximately 24 grams of carbohydrates with 3.8 grams of fiber and 7.39 grams of sugar. It also provides 2.29 grams of protein, less than 1 gram of total fat and 41 milligrams of sodium. 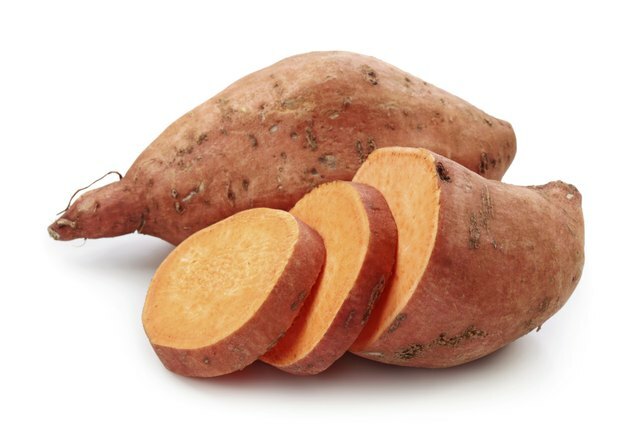 A medium sweet potato is a rich source of vitamin A, providing 1096 micrograms of this nutrient. It also contains several other essential nutrients including vitamins B-6, C, E, K, thiamin, riboflavin, niacin, folate and pantothenic acid, as well as numerous minerals such as calcium, iron, magnesium, phosphorus, potassium, zinc, copper, manganese and selenium.